Andouille, a staple ingredient in South Louisiana cooking, is a well-seasoned, heavily smoked sausage that has been influenced by the many different people settling the La Cote des Allemands, or the German Coast. French, German, Acadian, Spanish, African, and Creole cultures were mixed in this area which is now St. Charles and St. John the Baptist Parishes. The strong German traditions of making sausage were carried to Louisiana in the 1700's. Since French was the language of the area, like many other things, including family names, the sausage was given a French name, andouille. Each family had its own recipes for making andouille as well as different techniques for smoking, all of which were highly guarded and rarely shared. Because pork is the main ingredient in andouille, it was at the boucherie, or the butchering of the hogs each winter, that most all of the andouille was made. At these community gatherings families shared hogs and the meat products made from them. Others purchased the meat products needed to keep them through the winter months. The smoking techniques of Nelson Jacob made his andouille one of the favorites. His wife, Camille, decided the couple should sell their popular andouille, and with her lead, they opened a small store in Milesville, one of several small communities which now make up LaPlace. With the opening of this store in 1928, the Jacobs became the first to make and sell andouille commercially. Nelson Jacob's family came to Louisiana from Germany with the second influx of German immigrants in the 1750's. Damien Jacob, Nelson's father, was a rice farmer in Jacobtown (a small community in part of what is now Reserve where several Jacob families settled) in the late 1800's. Damien died in 1906 when Nelson was only ten years old. According to local historians and Nelson's granddaughter, Mary Ann, Nelson was then raised by the Madere family in Milesville. During World War I, Nelson was stationed in France where he met Camille Charnet. Camille was from the area near Vichy, France. She came to Louisiana from France as Nelson's bride. The couple built a house in Milesville across the road from the Maderes. Later, Camille's mother and sister also came to Louisiana. Nelson was then working as a pipefitter at Godchaux Sugar Refinery, while Camille and her mother were sewing hats and clothing for people. Shortly after Nelson and Camille Jacob, locally known as Bragger and Mam-Bragger, started selling andouille the couple opened N. Jacob's General Merchandise Store in the old Alexander building in Milesville. Out of this store the Jacobs sold their homemade hats and clothing, sewing supplies, other essential goods, and of course Jacob's Andouille. The Jacob children were growing up in the family business learning to make andouille, smoked sausage, and the other meat products being made by their father. Henry, their youngest son, took the greatest interest and stayed working in the family business. In 1947 the Jacobs purchased the old Maurin's Home Staple Store building in LaPlace and moved their business into this location. This building housed the local Postal Service, a bar, a barbershop, and N. Jacob's General Merchandise Store. When Bragger passed away in 1949, Mam-Bragger continued to operate the business with her son, Henry "Diddy" Jacob, who carried on the family tradition of making fine pork products and great andouille. Mam-Bragger was still active in operating the business when she died in 1978 at the age of 78. With her passing Diddy's daughter Mary Ann, who had been involved in the family's business for several years, took a more active role in running the business. Thank you Just for Cooking for the versatile blogger award. I appreciate it very much! In large pot, heat oil over medium heat. Add onions and pinch of salt, cook 2 minutes. Add andouille sausage, stir, cook 2 minutes. Add, potatoes, cream of potato soup, chicken broth, garlic, bay leaves, salt, pepper and white pepper. Stir well. Bring to boil, reduce heat and simmer 30 minutes. Enjoy! Help spread the word about Christine's Pantry! Share this post. now i'm totally craving soup! sounds delicious! I love sausages ! Adding it in the soup sounds yummy ! I love this recipe and can't wait to try it! It's so good, I just had to "pin" it on my Recipes! Pinterest board (I hope you don't mind). Thanks for sharing your recipe, Christine! Thank you so much! Enjoy the soup. I love cheddar broccoli soup. But I do enjoy all kinds. That is quite an extensive history. Very fascinating. 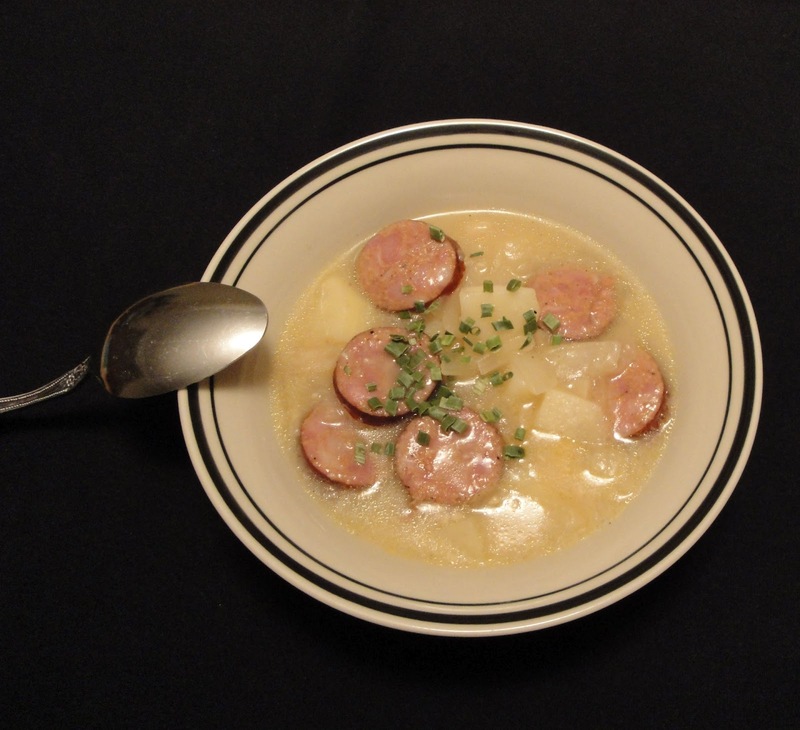 This looks SO good--I love the spice of andouille, and I'm sure it's great combined with the creamy potato soup. I really love andouille sausages, and the soup looks hearty and delicious! Great story on the Jacob family, and really glad the second generation has continued the family tradition. I love a good andoulle sausage! Great soup! A must-try recipe! I've given you a "Happy Blogger Award" @ http://sandrarecipeblogsite.blogspot.com/ by the way ;) Love, love your posts! Thank you, Sandra for the "happy blogger award". I truly appreciate it.